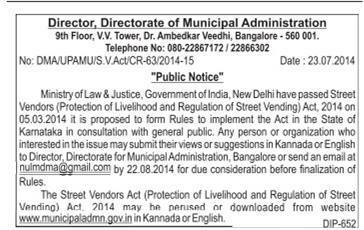 The Central Government recently passed an act to protect the rights of street vendors – the Street Vendors (Protection of Livelihoods and Regulation)Act, 2014. The Karnataka government through a G.O dated 14/07/2014 , No. NaAE81MLR has constituted a committee under the chairpersonship of the Director, Municipal Administration to frame rules for the committee.